Wondering what to do with the pulp after juicing your carrots? 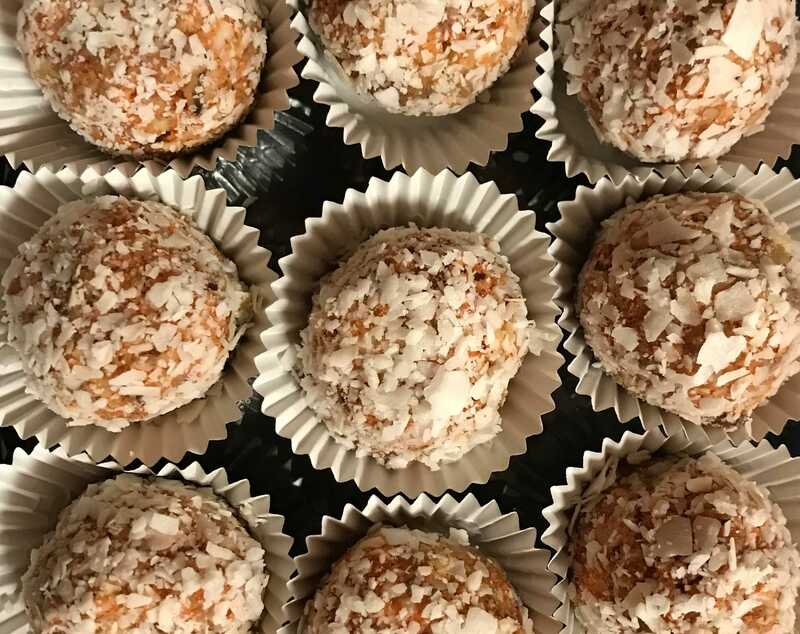 Try making these no-bake Carrot Cake Bites! Juice carrots until you have 1 1/2 cups of carrot pulp. Or if you do not have a juicer, finely grate carrots and use a paper towel to absorb the excess water from the carrots. In a food processor, process the nuts and dates until paste-like. Add 1 cup of the coconut and the spices. Process until combined. In a large bowl mix the nut mixture with the carrots. Using a scoop or your hands, form dough into bite sized balls, then roll in remaining 1/4 cup of shredded coconut. Chill for 30 minutes and enjoy a healthy snack that happens to also be gluten free and vegan. Want to learn more about Juicing and receive healthy juicing recipes? Join us on 2/21/19 for a Juicing For Better Health Demonstration in our office at 7:00. Cost: $10 per person, or 2 for $15 if you bring a friend. 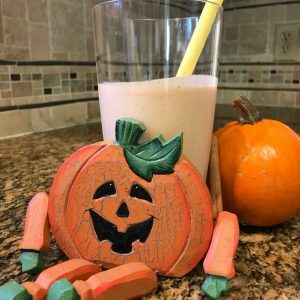 Pumpkin is a low calorie, but nutrient-dense food. It contains fiber, potassium, and vitamin C which helps support heart health. It is also a good source of beta-carotene, an antioxidant that gives orange vegetables their color. Blend in a blender until smooth and enjoy! Enjoy with milk or sprinkle over yogurt. 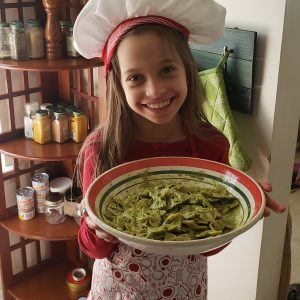 Calling all Moms with Picky Eaters! In blender or food processor mix raw spinach, nuts, garlic, oil and water and a pinch of salt. There’s no better way to give your picky eater 3 servings of raw veggie goodness. Delish! Juicing is a great way to help you eat your 6-8 servings of vegetables a day! Many people who struggle eating their veggies can consume more by juicing. Juicing also allows you to consume more nutrients by adding a variety of different vegetables which perhaps you normally wouldn’t cook, but throwing them in a juicer is simple. Without the pulp, the body can quickly and easily absorb the nutrients to improve your nutrition and health. 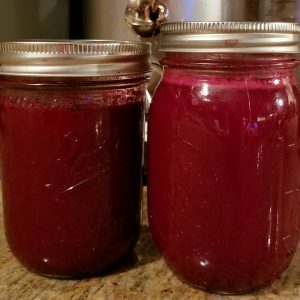 With time, juicing improves recovery time as well by adding essential minerals that we normally will not get with solid foods. We have learned that our farmland soil has been depleted of essential minerals compared to 50 years ago. A handful of spinach, for example has 10 times to 50 times less minerals depending on the source. Therefore, in order to get those minerals you would have to eat about 20 lbs. of produce every day. This is very hard to do! But not if you are juicing! You can get these 20 lbs. easily. Another challenge can be with intestinal absorption. Our ability to absorb nutrients can be deficient due to unhealthy lifestyles, pollution and gut dysbiosis. With juicing you increase your chance of getting better absorption, almost instantly! So grab some veggies and get juicing! 2 Apples, remove stem and blossom, seeds can remain, cut into 4-6 pieces. 1 Pear, prepare as above. 2 Carrots, peel and remove both ends. 2 Stalks of Kale, wash well. 1 Beet, wash, peel and remove both ends, cut in half. Combine in Juicer and Enjoy!